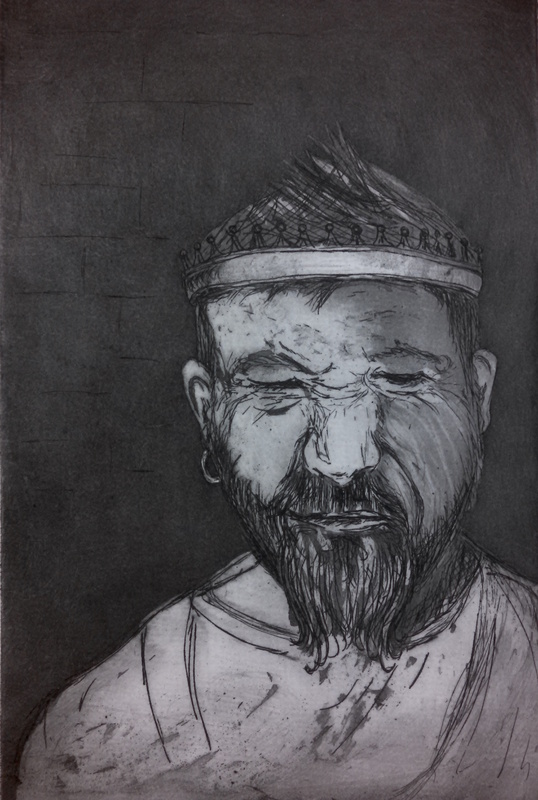 There is some magic that happens between the scratching of a design on a metal plate, submerging it in acid, watching tiny bubbles form…inking up the plate, painstakingly wiping the access ink off, placing plate and paper on pressbed, cranking it through the press, lifing up the blankets and paper to reveal a print. Pure magic. 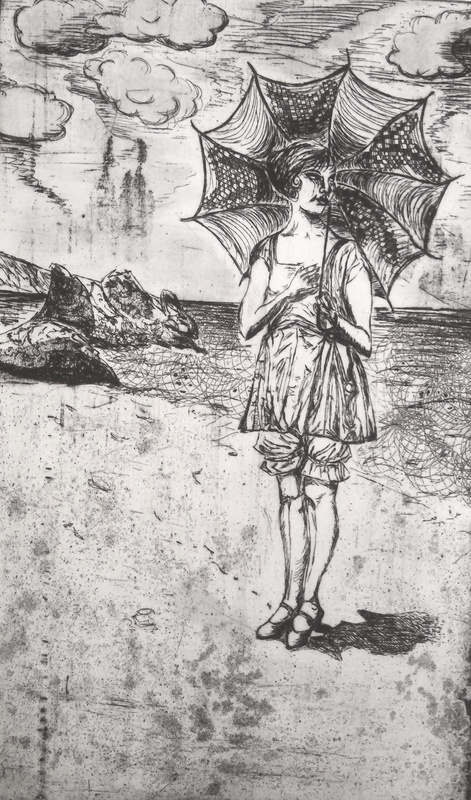 These are some of my recent etchings. Prints are for sale. Prices upon request. 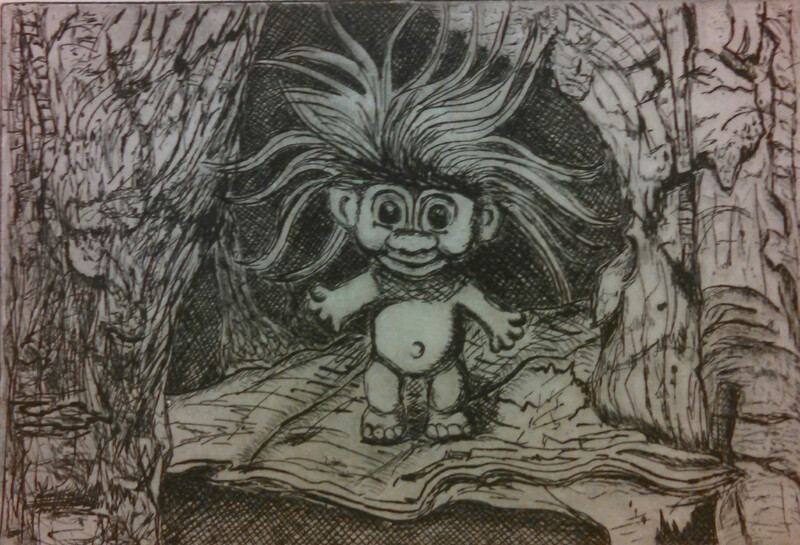 This entry was posted in art, artworks and tagged etching, parasol, printing, troll doll. At the beginning of the my independent study in painting this semester I was asking myself: What do I want to paint now? What do I want to say? Do I want to paint a variety of subject matter, maybe a landscape and a self portrait, things I don’t typically paint? I decided I wanted to illuminate little, overlooked objects, vintage toys, random things. I got lost in the details of the things I was painting and the relationships, or possible interactions between the items. While I enjoyed the details and the suggested narratives, I also enjoyed just what I could do with paint now. I started painting with the idea that it didn’t matter so much what I was painting as how I was painting it. 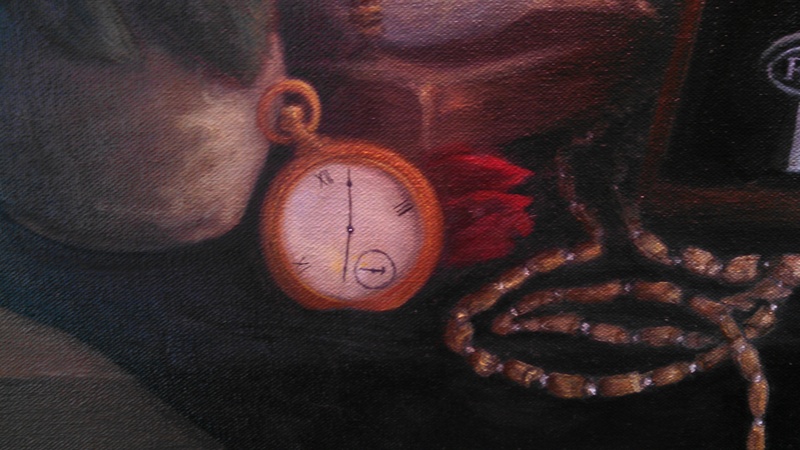 As I combined various objects and painted them, stories began to form, memories were evoked. I thought about specific memories and how to reproduce them in paint and what viewers might see, what they would identify with, and how my vague suggested memories might ignite the viewer’s personal memories. I explored the relationship between vision and memory and experience and how these things shape how we see the world, the space or discrepancy between what we see and what we remember, and the pictures in our minds versus the outside world’s images and how they can spark our memories. 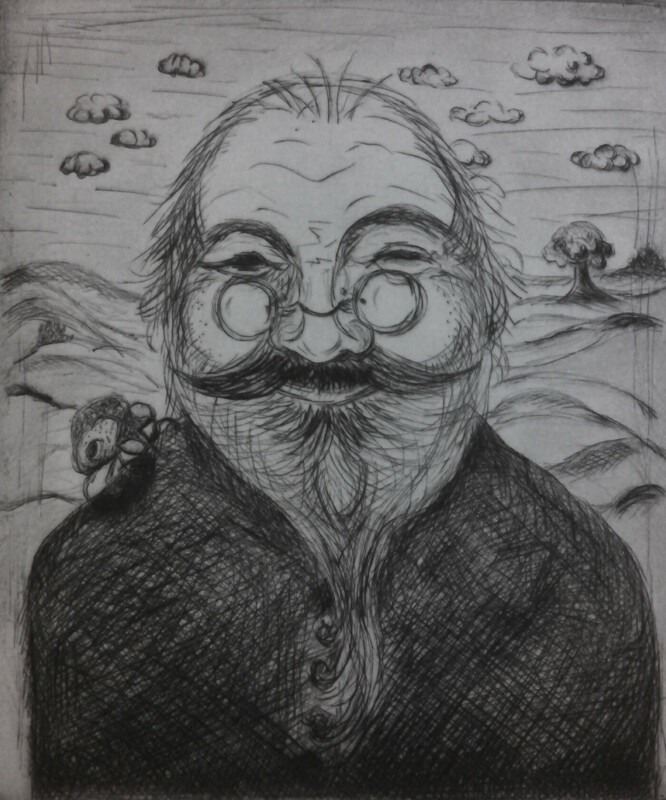 I wondered about the role of nostalgia in my work. What is evoked for you? 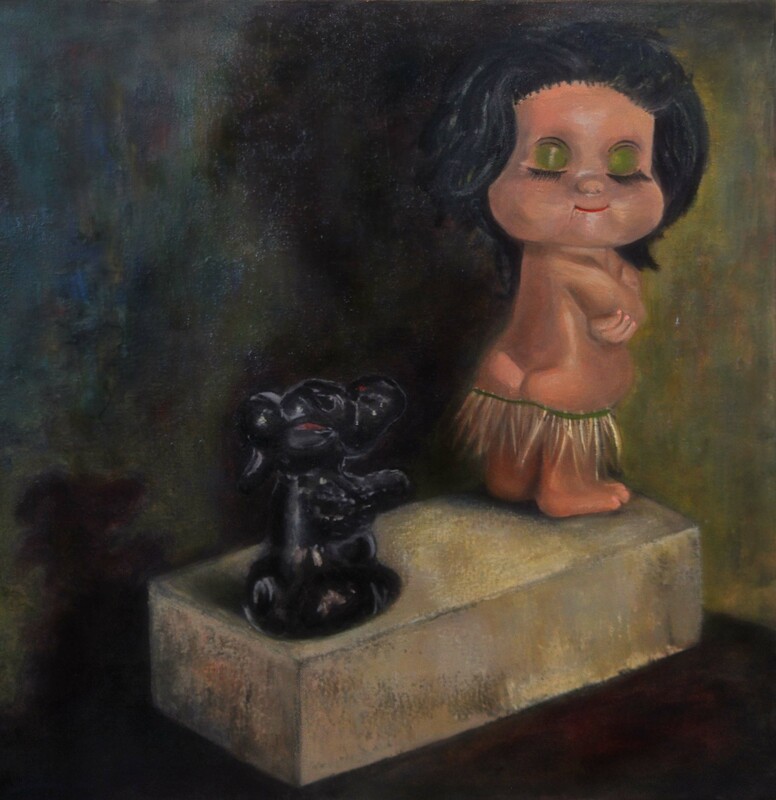 This entry was posted in art, artworks, painting and tagged creepy dolls, nostalgia, oil painting, special little places, still life, toys, vintage toys. I love to paint objects. 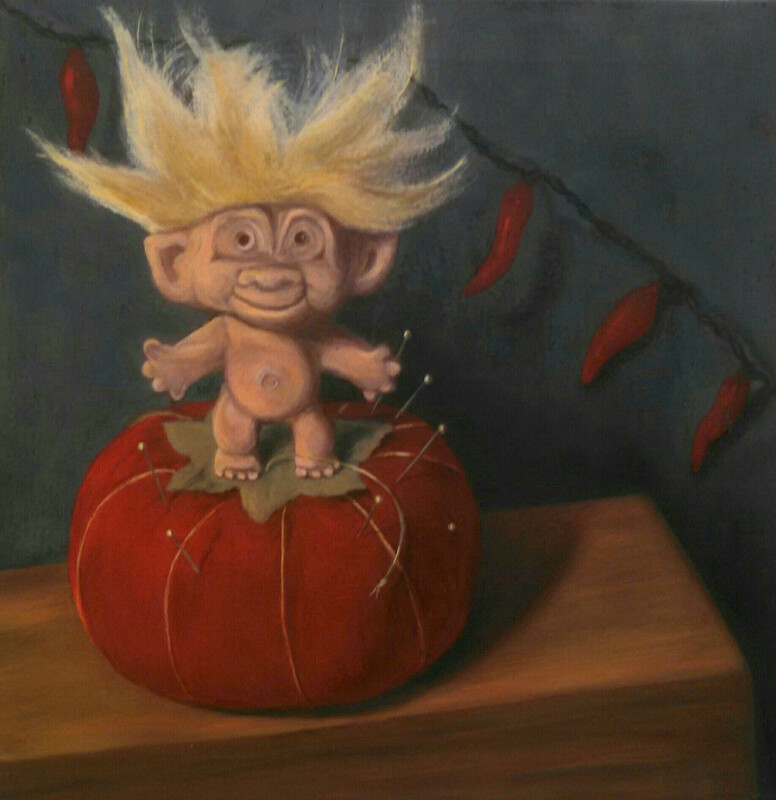 The still life paintings I create for myself include antique and vintage, sometimes kitsch, sometimes creepy, sometimes random, items. These are the things I love to look at, the things I collect and surround myself with. 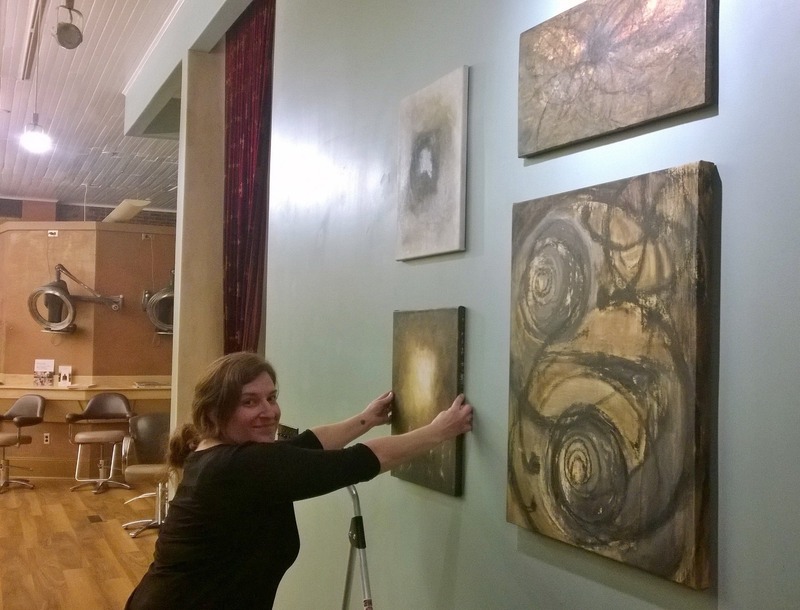 On canvas, I surround them with abstract elements, exploring personal connotations and meanings of the objects and their history. My love of things, arranging them, lighting them in a way that highlights the intricacies of the item, creating shadows that interest, that could capture some other mystery, makes me also want to capture other peoples’ objects and immortalize them in oil paint. Do you own a cherished heirloom item or items that you’d like to share with other members of your family? 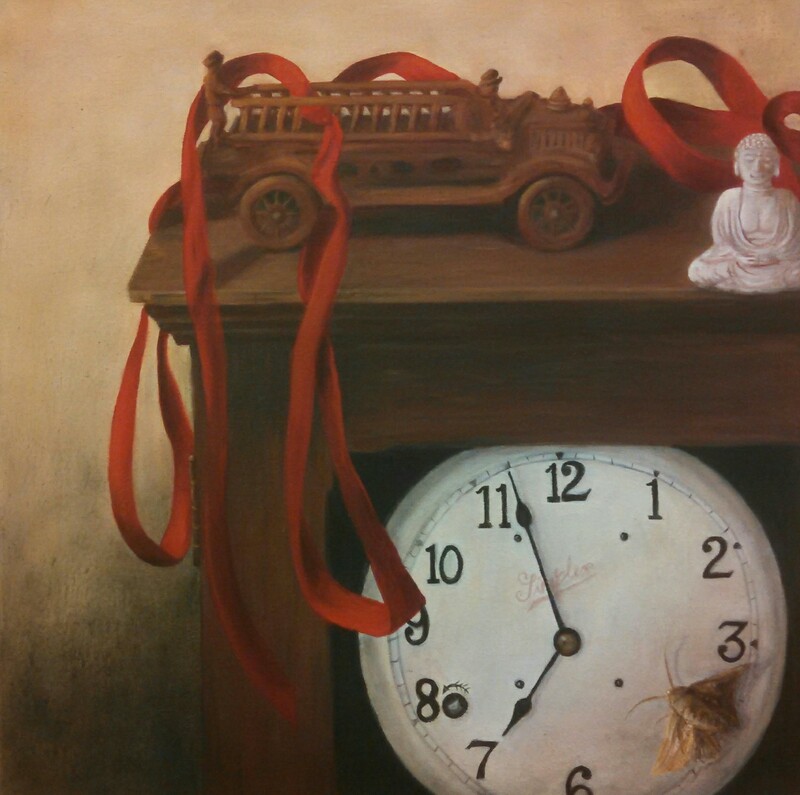 All of you can’t have the same clock on your mantel, or your grandmother’s babydoll on your shelf. 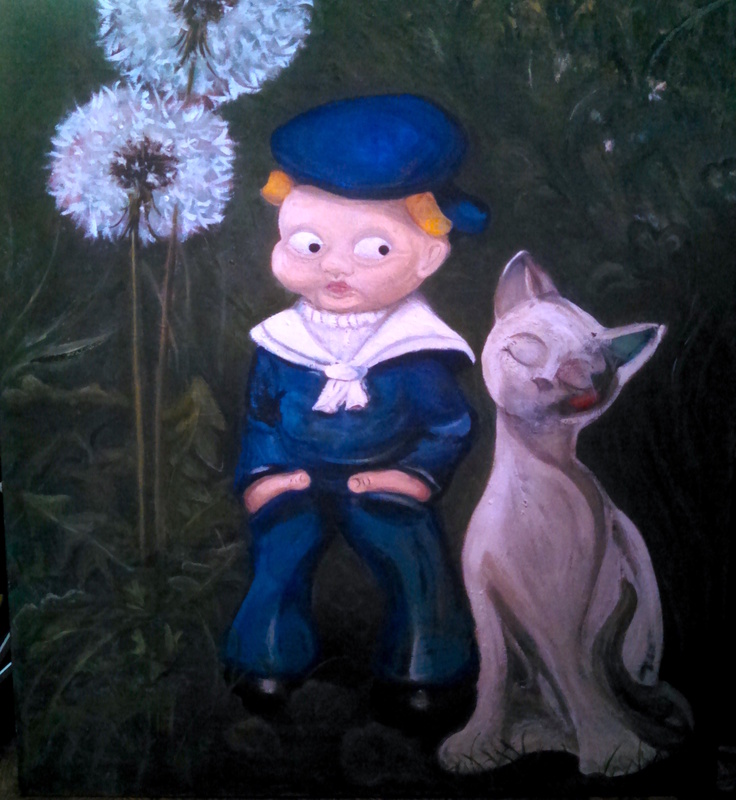 I could compose these items in a significant and sentimental commissioned work just for you! So someone in your family can own the cherished object and someone else can display the unique painting of it. This past summer I painted for my step father. I looked around his house and selected items that said “Moe.” A metronome, an hour glass, his grandfather’s pocket watch, his mala beads, I combined these things with a small clay vase of fresh roses in rich red to add the vibrancy of life. And a bug crawls up the front of the table, just for fun. I call this painting Time for Moe. 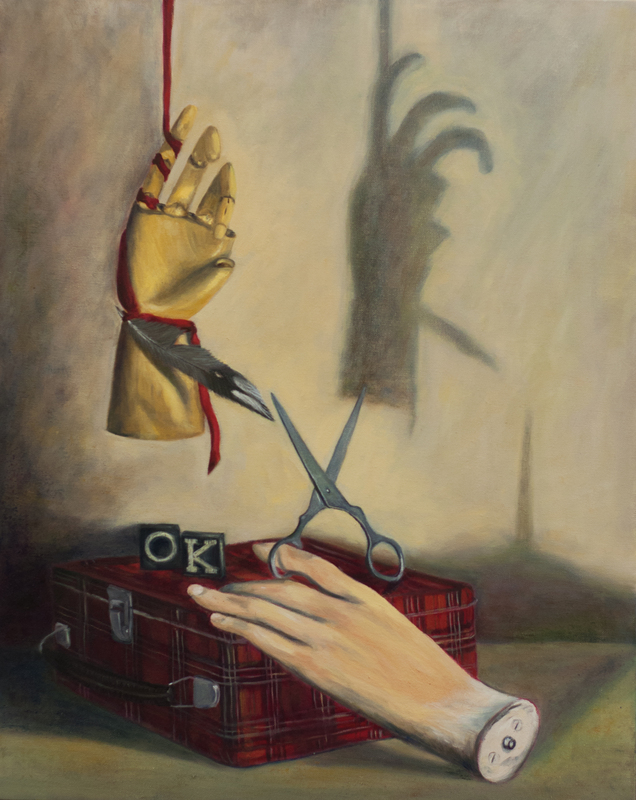 This entry was posted in art, artworks, painting and tagged commissions, heirloom still life, immortalize items, narrative, oil painting, still life, things and shadows, toys. 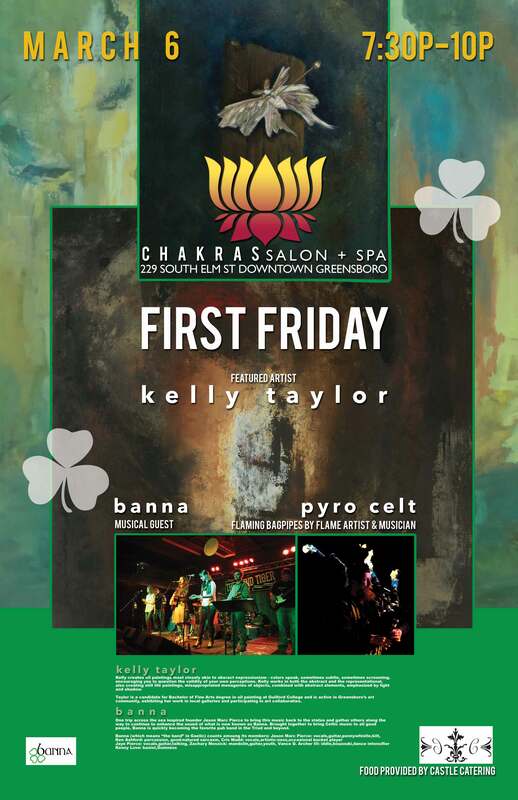 It was a great show and a fun first friday/opening event. I love Chakras! This entry was posted in abstract, art, artworks and tagged abstract, art opening, greensboro first friday, paintings. No intention. Movement. Make a mark. Meditative but spontaneous, energetic, allowing. Step back and look. Feel. Respond. I let go and let things happen and accept and interpret later. A flame emerges, then a figure behind it. Light requests to be present on the second canvas. The same colors start to appear in both canvases, a tiny echo of one in the other. Lots of layering and light and dark colors create depth and space. Bold brushstrokes and palette knife marks contrast with subtle detailed areas. And I get lost in the marks I’ve made – masses of of smooth color and the interaction of the colors. Two paintings. One darker, almost ominous, visceral. One lighter, earthier, greener. This entry was posted in art, artworks, painting and tagged abstract, colors, expressionism, mark making, oil painting. 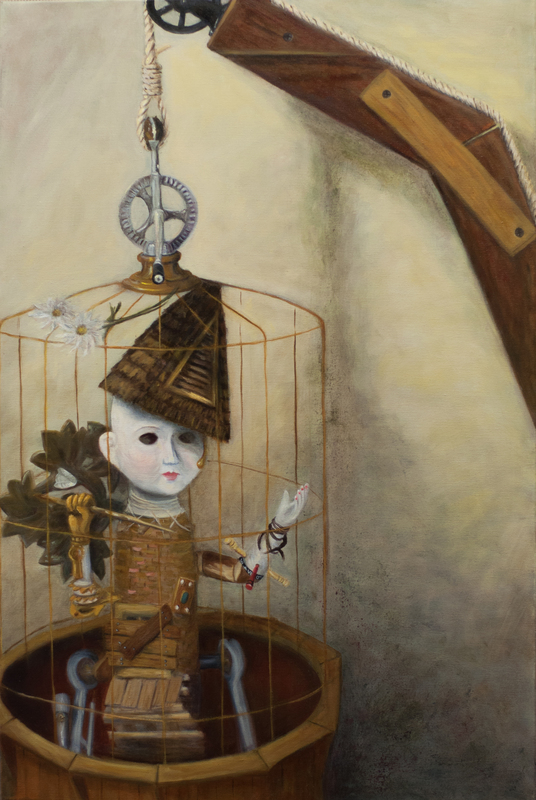 A misappropriated menagerie of items: a puppet, a porcelain doll, a sewing box, a brass bell, an iron parrot – remnants of my childhood where dysfunction is the family heirloom. 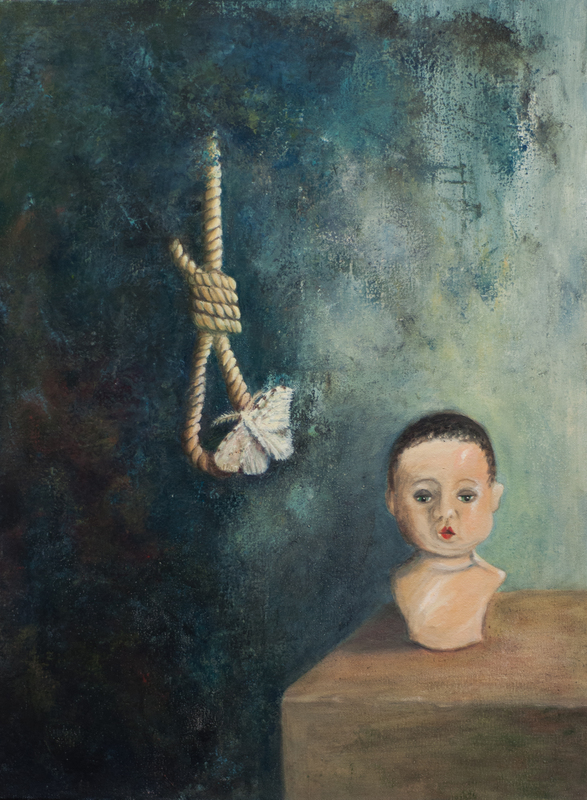 These objects are combined with abstract elements, integrating still life and abstract expression, recreating childhood scenarios. I work on both the abstract and the representational alternately in order to help them harmonize, to create a transition between these elements that is both convincing and dysfunctional. I invent still life environments on the canvas, emphasizing light and shadow, with disjointed plains, to foster feelings of dissociation. Abstracted items convey a lack of object constancy. Are these environments real? Are people or objects consistent, trustworthy, reliable? …Questions a small child ponders while learning to navigate in the world and realize their place within it. These works encourage you to question the validity of your own perceptions, and also to reminisce. 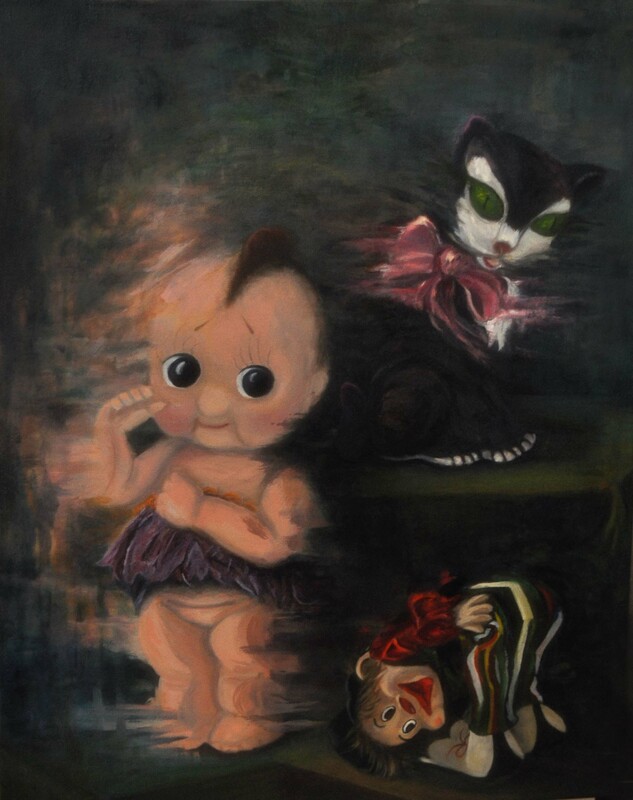 Whimsical clowns and a coquettish kewpie doll instill a sense of childish playfulness, asserting that there is still good among the wreckage. 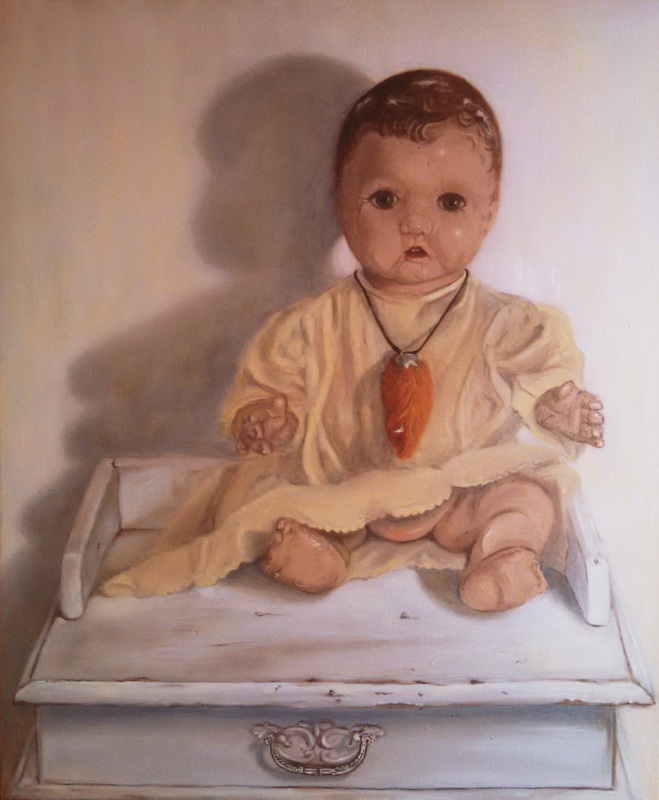 This entry was posted in art, artworks, painting and tagged abstract, art, creepy dolls, expressionism, narrative, oil painting, still life, vintage toys. 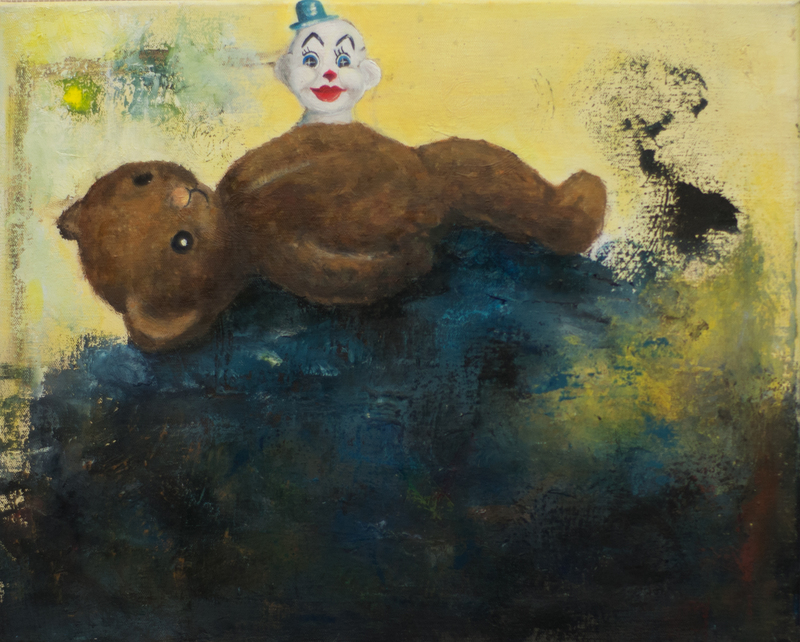 This entry was posted in art, artworks, painting and tagged abandoned objects, abstract, clowns, creepy dolls, expressionism, haunting, melancholy, oil painting, still life, time, vintage, vintage toys.